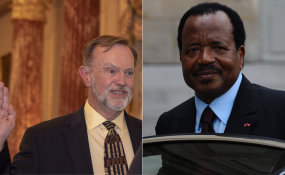 As the top U.S. diplomat for Africa visits Cameroon, pro-government groups are protesting what they call Tibor Nagy's interference in Cameroon's internal affairs. The coordinator for Monday's protest, Lilian Koulou Engoulou, said the demonstrators want Nagy to hear them and take their message back to Washington. America should stop interfering in Cameroon's internal issues, Engoulou said, and should help end the crisis in the English-speaking northwest and southwest regions by stopping Cameroonians based in the U.S. from funding what he calls terrorists and destabilizing Cameroon. Communications Minister Rene Emmanuel Sadi, who has previously accused the U.S. of harboring separatist leaders, said last week that Cameroon was outraged by Nagy's statements. Aime Manga of Cameroon Rights Watch, a local group, said officials should take Nagy's comments as helpful suggestions rather than criticism. It is public knowledge that Cameroon has a serious political and social crisis, he said, and Nagy's comments bring hope to many who want democracy. In comments made days before his arrival Sunday in Yaounde, Nagy said it's not always positive to arrest opposition members during times of crisis. He also called the death and suffering in Cameroon's rebellion heartbreaking and urged authorities to do more to end the fighting.